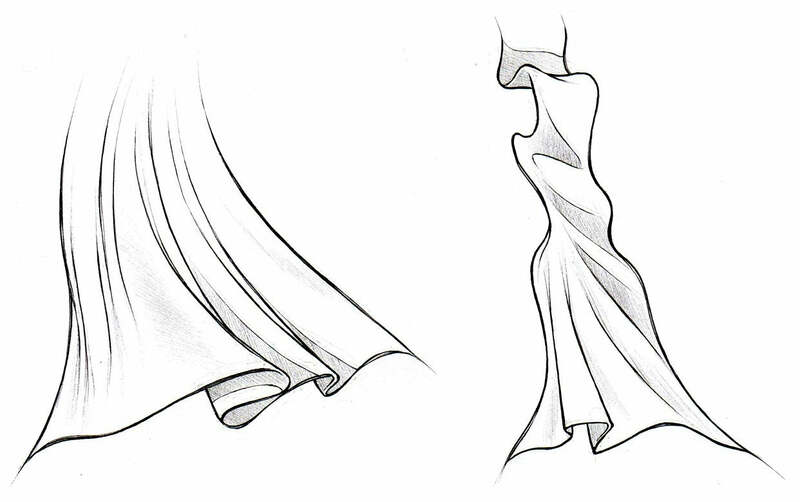 The most important thing to consider whenever you are drawing clothing or any type of fabric is the direction the fabric is going to be pulled in. 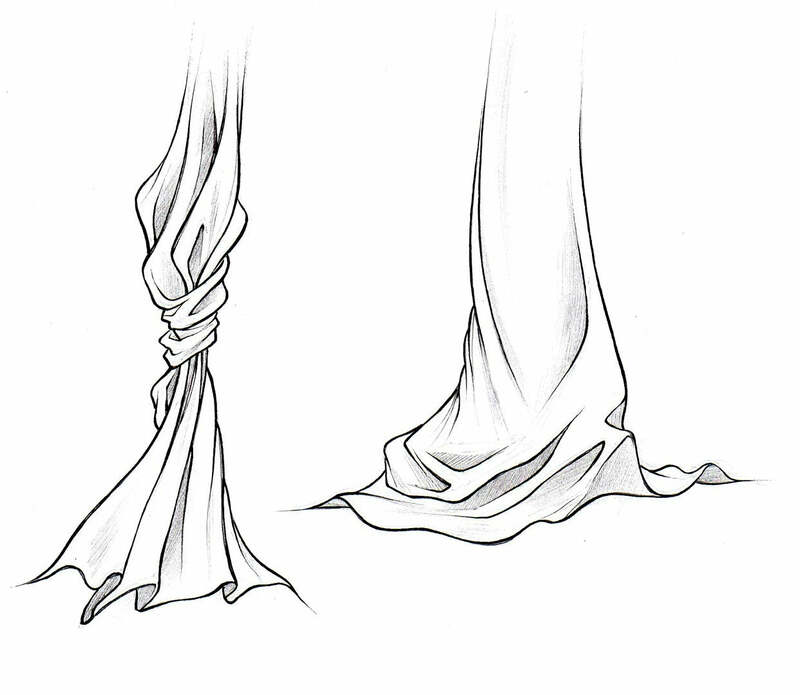 Folds are caused wherever the fabric is being stretched or pulled; figure out how exactly you want the fabric to move, and the rest is pretty easy. Always remember to consider the figure beneath the clothing; the cloth should reveal the shape of the figure beneath. I'll go into more detail on this later. At the left are some examples of basic types of folds. Notice the movement of each example shown; the fabric flows downward on the top left two, for they are being pulled down by gravity. This type of fold would be on something that hangs loosely, such as a cape or long shirt. On the lower left and upper right examples, the fabric is not only pulled by gravity, but stretched to the left (probably by an arm that is underneath the clothing). The folds become more horizontal than vertical the further it is stretched. Also notice how sometimes the folds are nested within one another. This will often occur at joints or areas in which loose clothing is bunched up. The lower right picture is a slightly more complex example of a more inert piece of cloth being pulled in a viarety of directions. 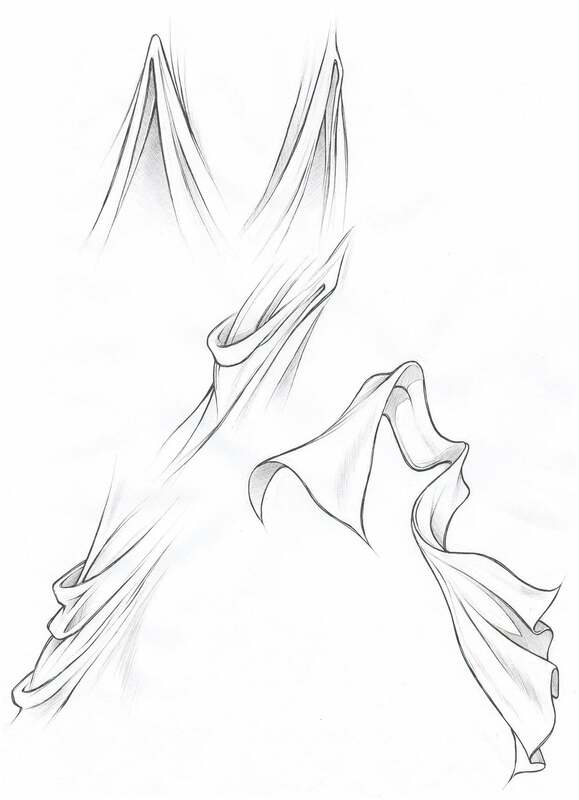 Notice how the folds follow the direction that the cloth is being pulled in. Here are a few more examples of basic fold shapes. On the left, the cloth is being pulled downwards by gravity and to the right by wind or motion. On the left, the long strip of cloth is bunched up near the top. Remember to use shading to give your subjects more form. Generally, you shade along a fold line, or on any places that you think a shadow would be cast. This takes some getting used to. It helps to look at actual folds sometimes to see where to shade. 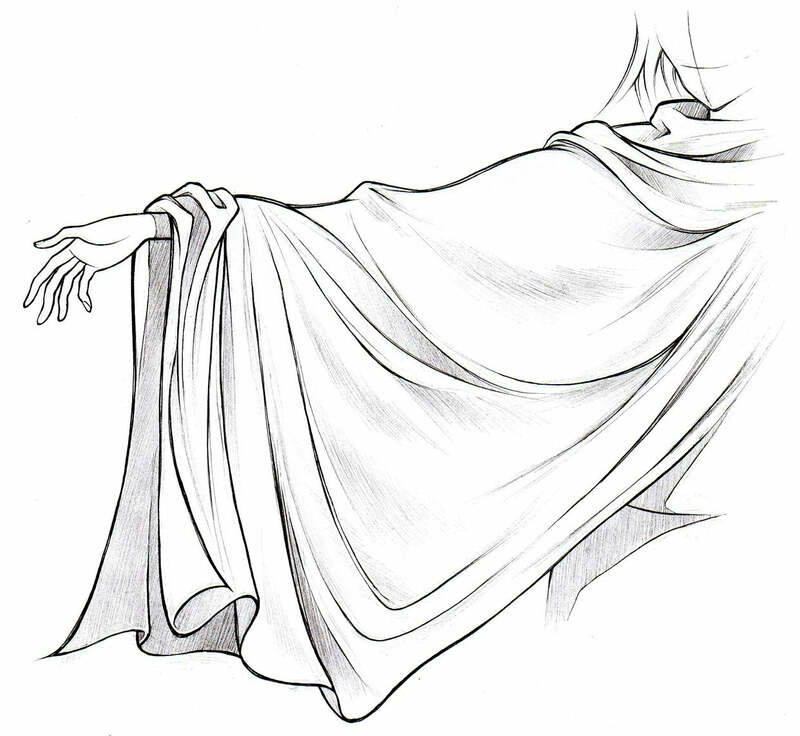 Sometimes, I'll sketch the drapes or a towel hung over a chair just to practice and get a better feel for how clothing is shaded. Here are a few more random examples, of a bow and some sleeves. The most important thing to note here is the shape of the folds at the joint of the sleeve in the middle. These are some more complex, overlapping and nested folds. The more detail you put into the folds, the more interesting it will look. On the left, notice how the fabric bunches up where it is tied together; the weight of the fabric pulls it down and causes extra creases and folds to form where it is gathered together. The tie itself is drawn with lots of detail, and the cloth beneath it blows loosely in the wind. The fabric is shaded around the folds and in the crevices formed by the cloth. On the picture to the right, a length of fabric is draped upon the floor; notice how the folds nest in one another and overlap, creating an interesting effect.